At this time of year in the studio I am a little tired of the color red!! LOL, too many Santas I guess, so for a change of pace – I decided to start some gourd ornaments. 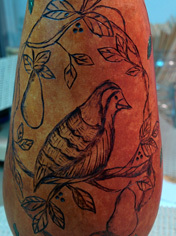 Here is one that is a wood burned design on a small pear gourd, a partridge in a pear tree, I burned the image in the gourd using my Colwood pen with a general detailing nib, and then used my shading nib. In between I lightly sanded the image and then applied a stain. The stain was a little darker then I wanted it to be but I plan to apply the metallic acrylic glazes. 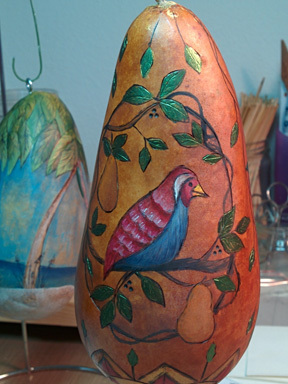 So yesterday I began adding a little color to this ornament with the metallic glazes. This entry was posted in Gourds and tagged Christmas, Christmas Ornaments, Gourd, Gourds, Holidays, Ornaments by Debra Maerz. Bookmark the permalink.